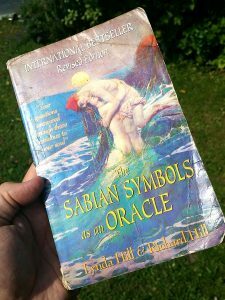 In this journal entry I share a Sabian Symbol which was chosen by one of my Global Moderators on the community forum for my metaphysical site, transients.info, for the purposes of understanding and explaining what the forum represents. I will also delve in some detail about what the Sabian Symbols are. But quickly, the Sabian Symbols can be compared to picking a single tarot, angel or oracle card to represent the now, a situation, a question, and so on and so forth. This is the card that came up to explain what the Roundtable Forum is all about. This Symbol shows being able to make sense out of complex systems and to be able to apply them in your everyday life. However, you may still be puzzled by the deeper meanings of your situation. The key is often found in old knowledge and wisdom or systems of understanding like architecture and astrology. Perhaps you feel ‘boxed in’ by situations and need to be able to strategise your way out. You must seek what is already known in order to understand. Knowledge is available to you. Studying ‘the secret mysteries’ can reveal answers to life’s questions. Gaining control of one’s inner and outer life. Astrology. Architecture and strategic planning. Systems of thought laid out. Maps. Mandalas. Meditation. Tibetan monks. The Caution: Ignoring the old wisdom for modern rational systems. Lack of imagination. Going into a situation unorganized and unplanned. Trying to gain the better of others by out strategizing them. Not wanting to put in the work. Let me now explain my thoughts on the Roundtable Forum. I created it, and chose the software it runs on because I knew it would be a major step up from what I was managing on Facebook, using their group based software. At the time the Facebook group had over 3,300 members. A friend once said to me that they thought it was like graduating from kindergarten to university, in terms of going from a Facebook Group, to a Forum — I completely agreed. The space it’s hosted on is the same webserver as transients, that I manage — which is pretty simple as I have a background in I.T.. So rather than the chaotic energies of Facebook, which I feel every time I visit, it’s a safe and cared for space right at ‘home’. It has really important features, such as being able to pin / sticky threads to the top of boards, so the key information is not lost. Each board represents the categories and topics of what transients is all about. One link allows all new posts to be displayed in the one spot. The sole reason I continued on with transients — www.transients.info — after starting it as a personal blog in 2011 and molding it into a community a few years in, which included regular authors and guest posts, was for spiritual development; I cover a range of topics and approach the angle in my own unique way. As of 2017, I shifted away from using it for that sole purpose, and in 2018 I have my own personal site now, laron.nz, and that includes this Journal, which is a type of a blog. I plan to write a book eventually on spiritual development, as well as hold workshops. So now you may get that the underlying foundation and purpose of the Roundtable Forum is for spiritual development, with a strong focus on healing and self-awareness, but which also has a range of interesting topics that fit into the esoteric, spiritual and metaphysical world. I’ve done a great deal of spiritual development now, approaching my awakening from many a direction and healing modality. I’ve also become a healer, and as a result my claircognizance became stronger, which helped me find the most efficient ways to progress, and help others progress. I came to learn that I am also a volunteer soul. Within the more important boards on the Roundtable is pinned information which can help a person a great deal on their path. One of the exciting aspects of the Roundtable is that we have some amazing moderators who are volunteering, for free, that specialize in certain areas of holistic health, who also provide so much wisdom and knowledge. Not every person will resonate with what I provide in terms of spiritual teachings, so there are others available that have their own unique ways of helping. Now that the reader understands this, that Sabian Symbol might just make more sense — a re-read might be appropriate. The creator of these particular Sabian Symbols, Lynda Hill, is actually a friend of my mother and lives in the Blue Mountains west of Sydney, Australia. Here is a detailed explanation of the Sabian Symbols: “The ancients divided up the sky, just like any other circle, into 360 degrees. They assigned each of the 12 constellations (star signs or zodiac signs) 30 degrees each: 12 times 30 = 360. The Sabian Symbols are a set of 360 phrases of words that correspond with each of the 360 degrees of the wheel of the zodiac, from Aries 1 to Pisces 30. Consisting from as little as 2 words (Virgo 2: ‘A Harem’) to as many as 21 words (Taurus 5: ‘A Youthful Widow, Fresh and Soul-Cleansed From Grief, Kneels at an Open Grave to Receive the Secret of Eternal Life), each one of these Symbols holds both a story and a unique energy field of their own. These images hold meaning for those degrees of the signs. Although the Symbols have their foundations in astrology, absolutely no knowledge of astrology is needed to use them. Lynda Hill is a well-known astrologer worldwide. 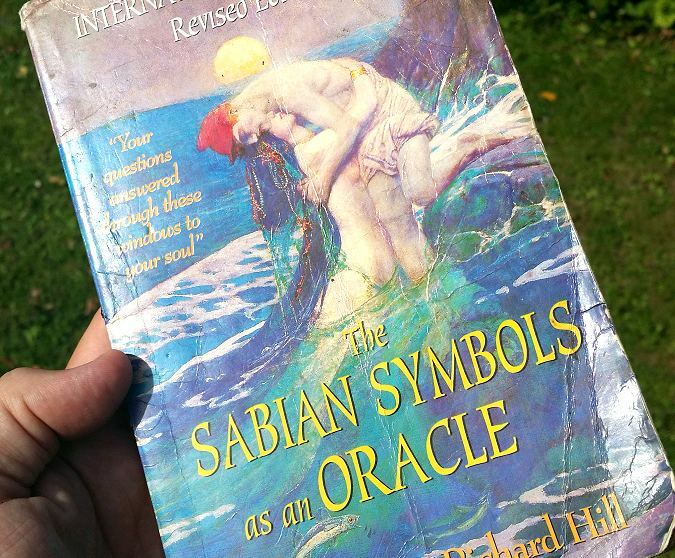 Her book, The Sabian Oracle: 360 Degrees of Wisdom, is one of the main resources of the Sabian Symbols. 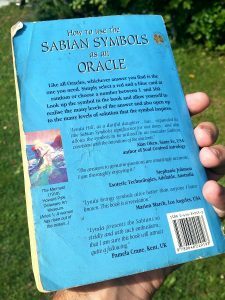 The Sabian Oracle book has different covers now, as it’s been out for many years, and there’s also an eBook version available. Here is a photo I took of the copy I have here at home. You can find the book on Amaozn here, and Lynda’s Sabian Symbol site here: https://sabiansymbols.com. The official book description is below. You can also access the symbols for an electronic reading online. Head over to https://sabiansymbols.com/oracle, touch or click ask the oracle button, and if you are on a desktop, just scroll down to see the symbol and description. This is where the Sabian Symbol for the Roundtable Forum included above, came from.